Treat yourself to a holiday in Syracuse and discover one of the most beautiful cities in the Mediterranean. Its territory encompasses more than three thousand years of history, as evidenced by the countless monuments, archaeological sites and museums, real archives of the glorious history of Sicily. The mild temperature and virtual year round sunshine make Sicily a popular destination in all seasons. Our holiday packages to Syracuse are constantly updated to guarantee tourists a totally relaxing break. Exploring the city in depth, understanding and appreciating all its facets would take months. However there is a route that will make the most of your time and takes into account the opening times of the main attractions. Start from the Island of Ortigia, where you can visit the Temple of Apollo. Dating from the 5th century BC, it is the oldest Doric stone temple in Sicily. Surrounded by columns, six on the shortest sides and seventeen on the longest, it has imposing and very closely positioned monolithic columns. A second row of columns on the eastern side preceded the area in front of the cell, emphasising, as was often the case in the archaic temples of Sicily, the primary aspect of the front. Continuing along Via Matteotti you'll come to Piazza Archimede, where you can admire the Fountain of Diana. Several roads lead off the piazza, including Via Roma, the main street lined with typical Sicilian shops. From here continue to Via Minerva and visit the Duomo. The cathedral stands on a site which has always been a place of worship. An initial temple, erected in the 6th century BC, was replaced by the Temple of Athena (or Minerva) built in honour of the goddess by the tyrant Gelone, which was subsequently incorporated into the existing architecture. The imposing Doric columns are still visible on the left side, both outside and inside the building, while the existing façade is one of the best examples of Baroque architecture in Syracuse. The internal structure has a triple nave basilica floor plan. The city's cathedral overlooks Piazza Duomo, one of the most beautiful squares in Italy, surrounded by numerous Baroque buildings and a host of bars and restaurants. Take a break and admire Palazzo Vermexio, the local council building, the Archbishop's Palace and the Palazzo Borgia del Casale. Walking down Via Pompeo Picherali you'll come to the Fountain of Arethusa, from where a seaside stroll will bring you to the entrance to Maniace Castle. Frederick II's castle, later renamed Maniace, was built in the mid-13th century. Since the demilitarisation of the area after the World Wars, several restoration projects have brought back the splendour of the castle. The itinerary continues to the Neapolis Archaeological Park, where you can admire the Roman Amphitheatre, the Altar of Hieron, the Greek Theatre, the Latomia of Paradise, the Rope-Makers' Cave and the Ear of Dionysius. Situated in the north-western area of the modern city, the archaeological park is an open-air museum and includes not only the most monumental part of the city but also many testimonies of various historical eras, from the protohistoric age to late antiquity and Byzantine times. Syracuse's other main attraction is the sea. Arenella Beach is one of the best known in the city and suited to the most diverse tourist requirements. Punta Asparano, the Maddalena Peninsula and the other beaches along the coast of Syracuse, including Eloro Beach (a long stretch of fine golden sand), are unmissable destinations for any holiday in Syracuse. More than 2,500 years of history are revealed in the form of cathedrals, fountains, and castles on this fascinating island. Explore the hall of mirrors, browse priceless religious paintings and marvel at the stylish Baroque architecture of this former palace. Even in a city full of superb Baroque architecture, this superb cathedral stands out. Discover over 2,000 years of history when you visit the oldest Doric temple in Sicily. 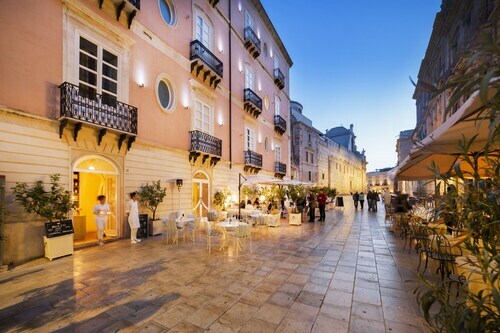 This family-friendly Syracuse hotel is located on the waterfront, steps away from Ortygia Seafront, Palazzo Montalto and Church of the Immaculate. Arkimedeion Museum and Teatro dei Pupi are also within 5 minutes. Syracuse Station is 20 minutes by foot. 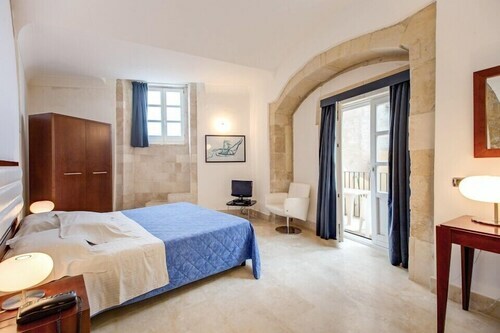 Located in Ortigia, this romantic hotel is steps away from Palazzo Bellomo Regional Gallery, Church of San Martino and Museum of the Sea of Syracuse. Church of San Giuseppe and Fonte Aretusa are also within 5 minutes. Syracuse Station is 25 minutes by foot. This family-friendly Syracuse hotel is located on the boardwalk, within a 10-minute walk of Porta Marina, Hypogeum of Cathedral Square and Antico Mercato. Palazzo Lanza and Arkimedeion Museum are also within 10 minutes. Syracuse Station is 17 minutes by foot. 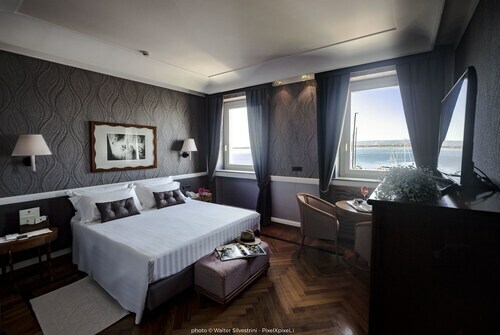 Offering direct access to the beach, this Syracuse hotel is steps away from Maddalena Peninsula and Plemmirio Marine Park. Terrauzza Beach and Ciane River and Saline Nature Reserve are also within 3 miles (5 km). 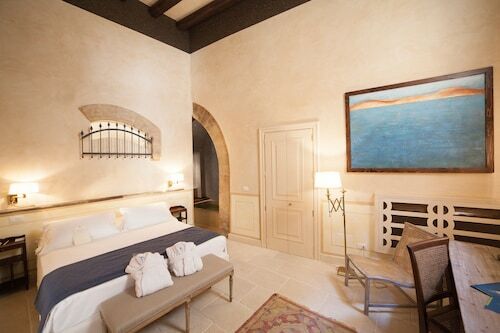 Located in Ortigia, this boutique hotel is steps away from Castello Maniace, Fonte Aretusa and Church of San Martino. 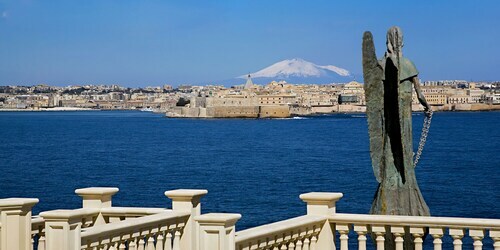 Tropical Aquarium of Syracuse and Palazzo Bellomo Regional Gallery are also within 5 minutes. Syracuse Station is 27 minutes by foot. 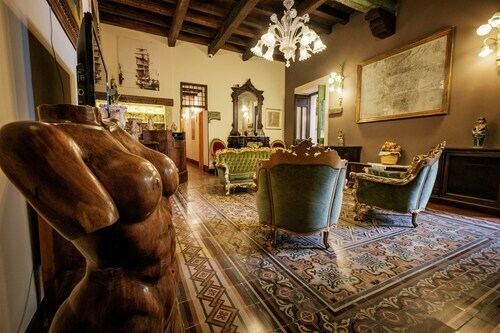 Located in Ortigia, this romantic hotel is steps away from Church of St. Mary of the Immaculate Conception, Palazzo Beneventano del Bosco and Palazzo Municipale. Cathedral of Syracuse and Piazza del Duomo are also within 5 minutes. Syracuse Station is 21 minutes by foot. 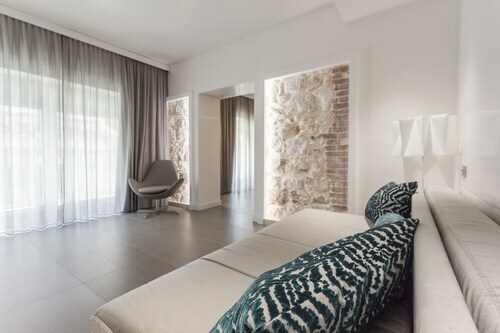 Situated in a rural location, this luxury hotel is 2.1 mi (3.4 km) from Church of Borgo Vecchio and within 6 miles (10 km) of Cavagrande del Cassibile Nature Reserve and Pineta del Gelsomineto Beach. Gallina Beach and Beach Lungomare Tremoli are also within 9 miles (15 km). Located in Santa Lucia, this luxury property is within a 10-minute walk of Syracuse Forum Ruins, Porto Piccolo, and Ginnasio Romano. Antico Mercato and Porta Marina are also within 15 minutes. Syracuse Station is 8 minutes by foot.